← time to go home —girls’ own pl. 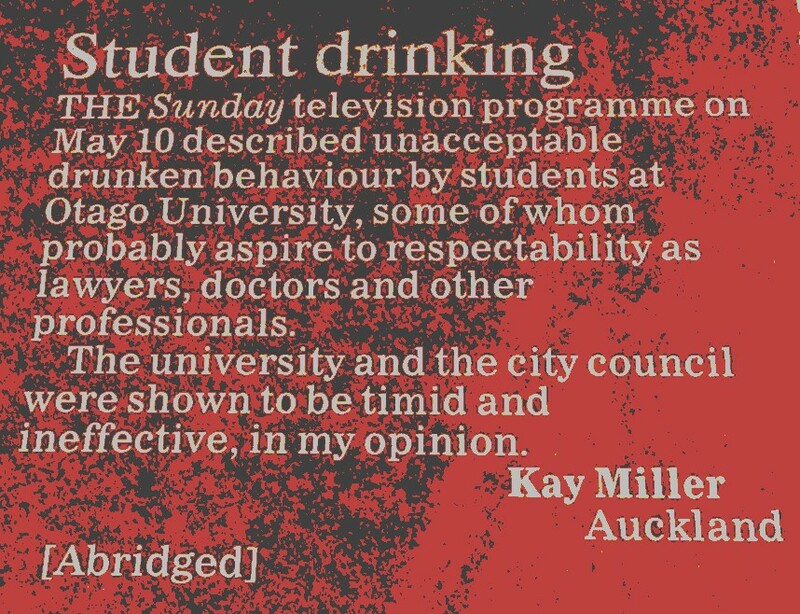 Sunday TVNZ were all ready to read a statement from OUSA’s president Paul Hunt tonight as part of feedback to last week’s show – but clearly all feedback has been canned. Maybe on NZ Police advice (?) – and due to increased youth activity in View Street today; referred to as “beepers and creepers” (yes, belligerent party-hard students and their boozy mates – no doubt prompted, if not paid backhanders by those making large profits in the liquor industry). Where does it end for the good residents of View Street? Let me spell it out: it ends with criminal prosecution of the people responsible for harassing and intimidating residents, and or bringing damage to private property. Police patrols are continuing in the immediate street area. They will do so for as long as is necessary while there is threat to person and property. This is a serious policing matter. As a consequence, this website continues to be closely monitored. Police are investigating further claims of harassment against a Dunedin woman who feels she has been made the face of an “anti-student” campaign. […] She told police cars were driving up and down her street all hours of the night and people were calling out her name, Acting Senior Sergeant Craig Dinnissen said. 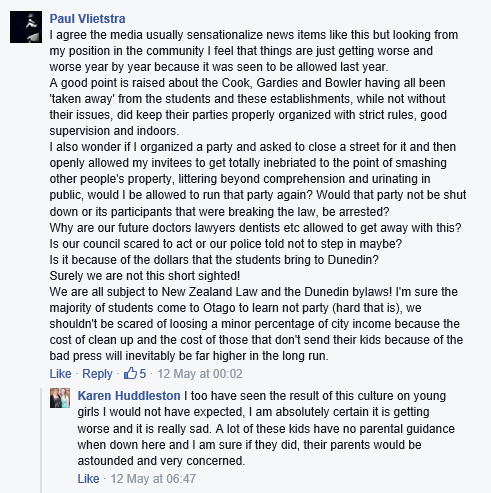 Are Dunedin tertiary students out of control? 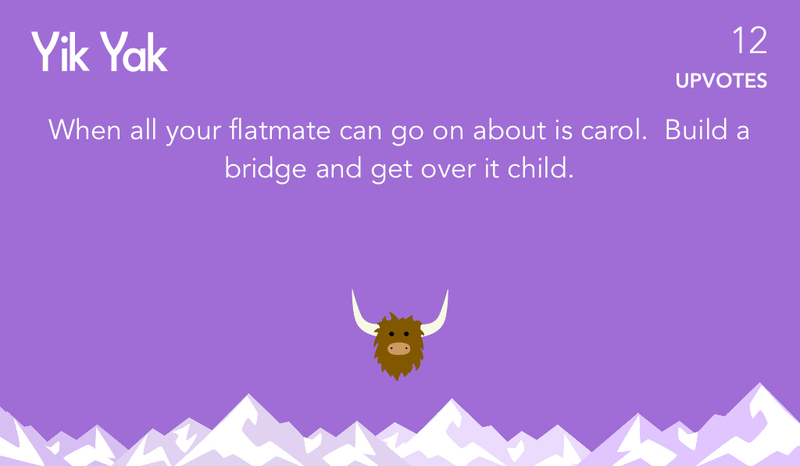 Posted at the Yik Yak platform this morning. More than a week on…. A gem! This child may be one of the worried people caught in headlights! The field of search for YikYak is currently focused on View Street and environs, for now. Top New Zealand doctors call for drinking age to be raised to 20 and booze sponsorship banned from public events in a push to reduce alcohol-related harm. The New Zealand Medical Association released its Reducing Alcohol-Related Harm policy briefing today. It recommends a raft of changes including hiking the drinking age, phasing out alcohol marketing and sponsorship at sporting and cultural events, stepping up screening and treatment services, introducing better education initiatives and raising alcohol taxes. Here’s my official music video for ‘Sing’ featuring the talented Pharrell Williams. Public awareness is at an all time low if people think students should be mollycoddled. I’m not talking Hyde Street. Neither was Carol or Jeff on Sunday TVNZ; nor other residents complaining to DCC, City Planning, Noise Control, Mayor, Vice-chancellor, Proctor, Campus Watch, and Police !!! Dunedin tertiary students are back in the national spotlight, following fresh reports of drunken disorder and harassment. 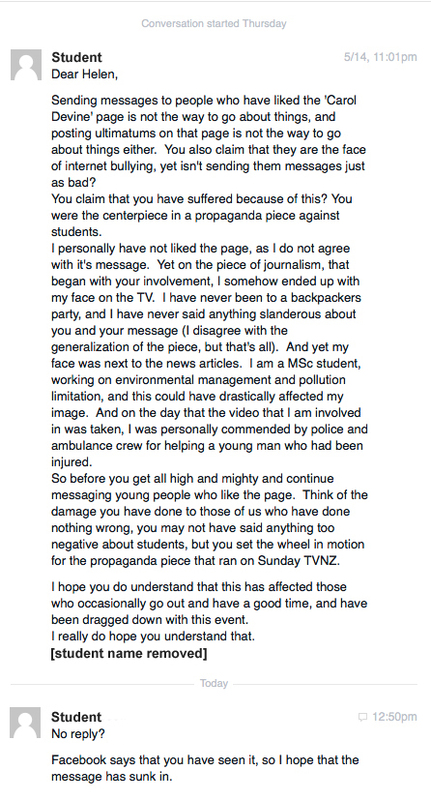 Police and university staff are investigating complaints by a local woman that she’s being victimised by students. And with that in mind, our word on the street team asked members of the public if they think students are out of control. 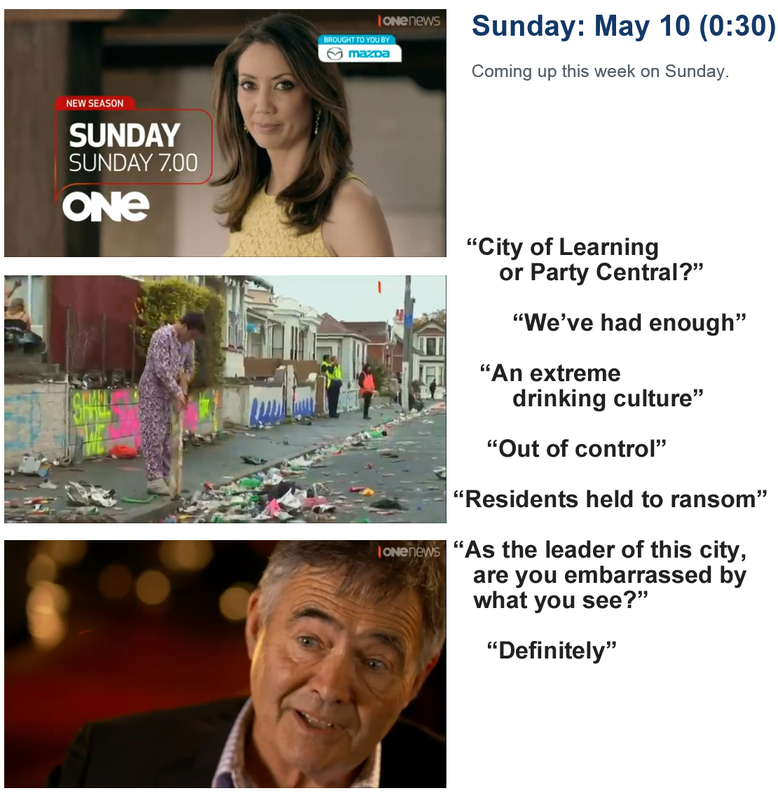 Way to go dunedintv – Why didn’t you ask the more socially responsible questions like: Is the pop-up party scene getting out-of-control in Dunedin? or Should the University put an end to the Hyde St party because the mayhem is influencing other dangerous partying around Dunedin? Shameful reporting when the real issue is buried. Talk about controlling the news in this town! Could the same names behind this be the same fat cats protecting their Mighty Booze $$$$ investments??? Street-wise investigative people don’t get hired by local media. No budget. Unprovoked sustained assault: The boy was approached by four or five males believed to be between 16 and 18. A 16-year-old boy is in Dunedin Hospital with serious injuries after what police have described as a “cowardly unprovoked group attack”. The assault happened on Malvern St on the street outside a house party between 10.30pm and midnight last night. Mob courage, a.k.a. vicious lowlife cowards. A 16-year-old boy has been arrested over an attack on a fellow teenager outside a party in Dunedin. Police said the assault on the 16-year-old boy happened on Malvern St outside a house party between 10.30pm and midnight on Saturday. Fire Service East Otago area commander Laurence Voight said anecdotally there had been “more activity” in the student quarter since the airing of the TVNZ programme, Sunday, earlier this month. 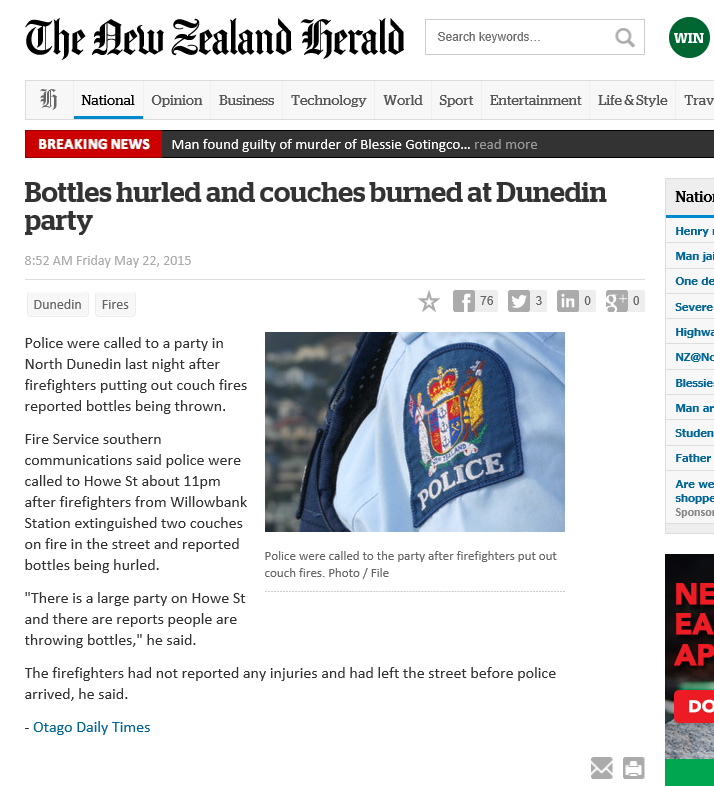 Firefighters attended two early morning couch fires in Dunedin, just days after a Fire commander noted student behaviour had worsened since the airing of a controversial television programme on student behaviour. The Fire Service was called to Grange St, North Dunedin, following reports of a couch fire just after midnight. Firefighters were again called out to the notorious student hotspot of Castle St North, following reports of another couch fire at 1.37am, a Fire spokesman said. So what is the Fire Commander trying to say – “Everything was just fine. We had it totally under control until someone had to go and blow it all by speaking out!” ?? What are the trouble-makers trying to say – “Screw you and your unfair criticism of us drinking to excess. We pay for the right to party hard here. The Uni advertises and sponsors it, the Council permits it and the Police go light on us, so what the hell are you complaining about?! What are the OUSA trying to say – “We’re not ALL like that. It’s just a few of us SEE !” ?? Ralphy, what I think is, none of the spokespeople live amongst the worst excesses of ongoing popup parties. Ignorance is their condescending bliss. A new group has just been established to preserve the heritage and amenity values of central Dunedin. It’s called City Rise Up, and founding member Meg Davidson joins us to explain what it’s all about. A good example of a foul development that is recent is in upper Duncan St, City Rise. A once lovely, well preserved villa now with three units jammed into the front and back of the section. All totally inappropriate as their design is ill fitting. This should not be allowed to happen. If this is medium density of the future, forget it.